One of the things that makes Vinology unique is the care and dedication our team puts in to creating the perfect dining experience. Each of our team members takes the time to learn about food and wine, our food and drink menu, and how to create the perfect pairing. We like to think it’s what sets us apart from our competition. We’re excited to kick off a blog series introducing you to our amazing team – their likes, their favorite dishes, their insider’s secrets. 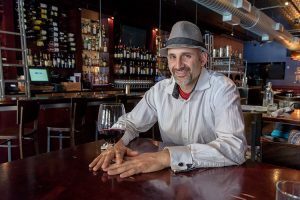 The first in our series is Vinny Jonna, Vinology’s general manager. What do you enjoy most about Vinology: I have learned my greatest lessons from this bar. It has been with me longer than any other job i have had. What dish inspires you and why? This season, it’s our Elotes appetizer. It was the award winner for the best vegetarian dish at Taste of Ann Arbor. It’s so delicious, I never get sick of it. My second choice is Terrarium, a new seasonal dessert that is just as beautiful as is delicious. What do you like about our wine program? Quite a few things! Our aggressive wine program, amazing happy hour, incredible value in the JJ Cellar program, and our wine club. We keep improving on each of these programs based on customer feedback and our own knowledge, and that’s exciting. What’s something fun to know about you? My father created a new word Metanoya (change of mind, a paradigm shift, retroactive realization based on a life changing experience). I experienced this in Califonia at Robert Mondavi’s vineyard, trying a private reserve Moscato. I realized great wine paired correctly with great food reveals a combination of flavor that is greater than each of those individually. I reflect on that each time I have a truly uplifting dining experience. What are your hobbies and interests? Family, food and wine, nature, philosophy, classic artists such as Archiomboldo, Gaudi, Van Gogh, Michaelangelo, and chess.